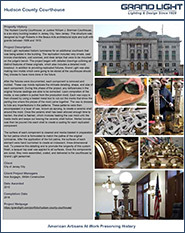 The Hudson County Courthouse or Justice William J. Brennan Courthouse is a six story building located in Jersey City, New Jersey. 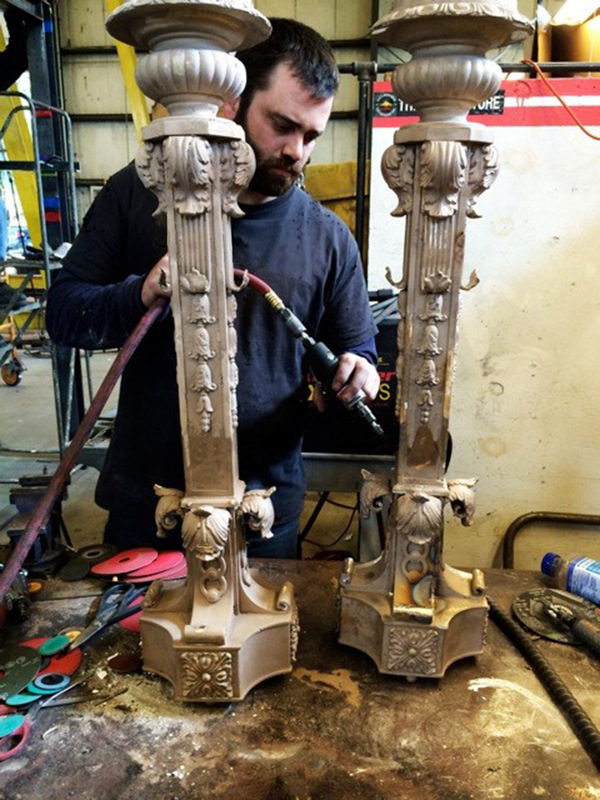 This structure was designed by Hugh Roberts in the Beaux-Arts architectural style and built with granite between 1906 and 1910 on property obtained from fourteen separate property owners between 1905 and 1914. 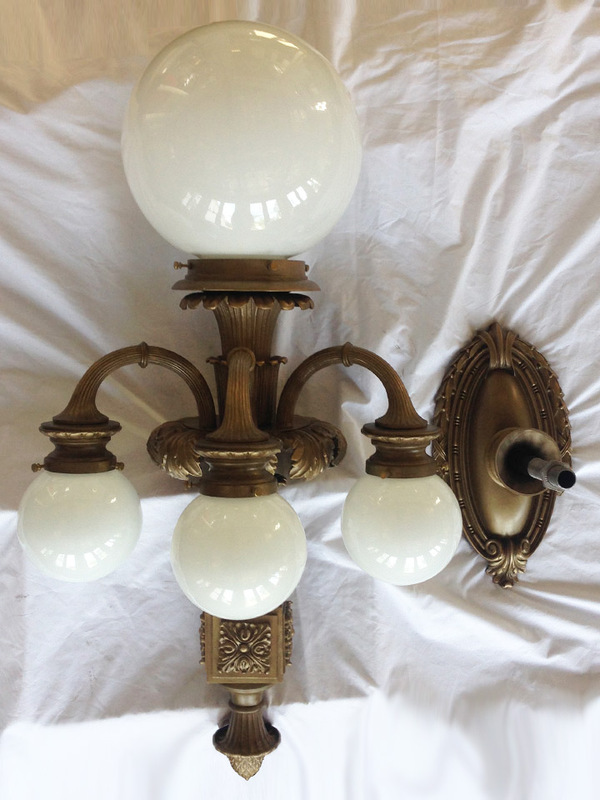 Construction of the building was done by the Wells Brothers and construction of the interiors and finishes were by John Gill & Son. 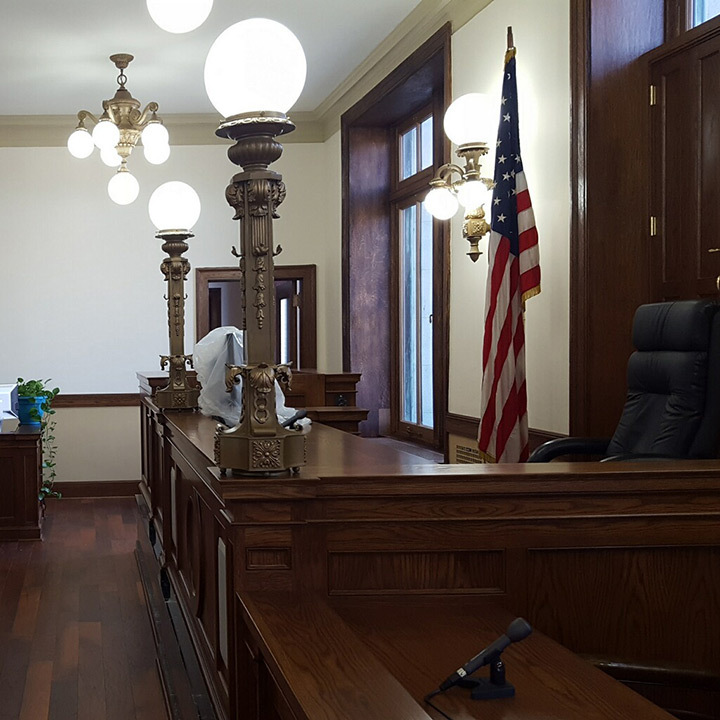 The Hudson County Board of Chosen Freeholders renamed the courthouse in 1984 in honor of Associate Supreme Court Justice William J. Brennan, who had served in the building as Hudson County Assignment Judge from 1947 through 1951. 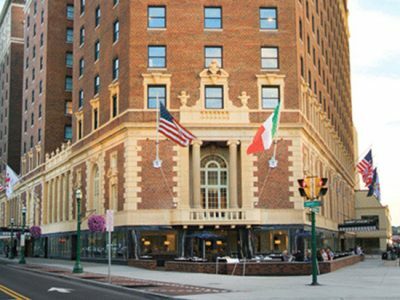 A planned restoration of the building was proposed in 1961 by Theodore Conrad proposing a conversion of the building into the new city hall for Jersey City. 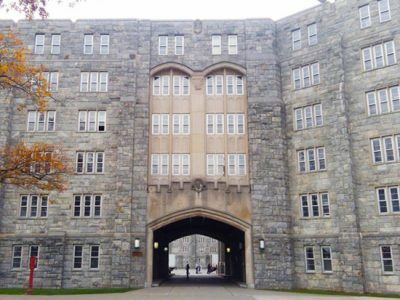 Conrad led a citizens group that lobbied for the preservation of the building, and got it listed on the National Register of Historic Places. 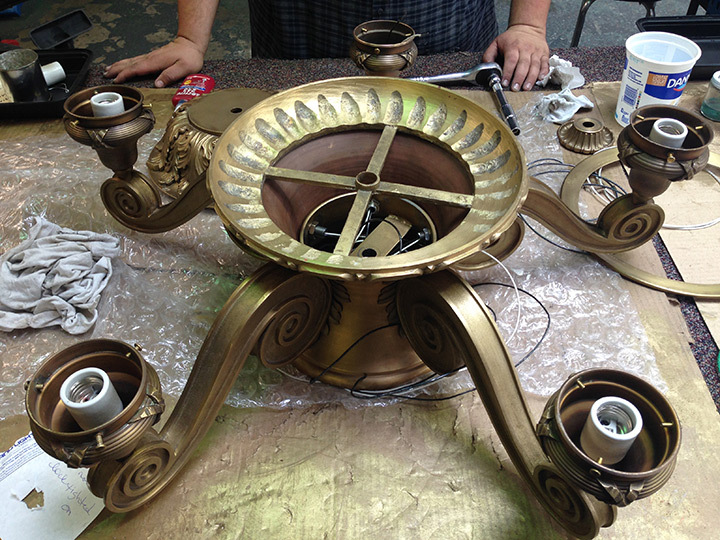 The restoration project resulted in the courthouse being reopened in 1985 for the use of the civil courts and other county offices. 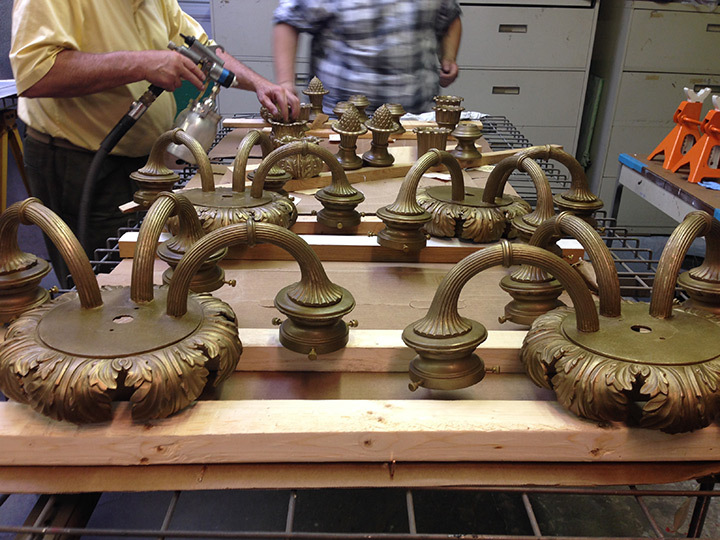 Grand Light replicated historic luminaires for an additional courtroom that was being added in the building. 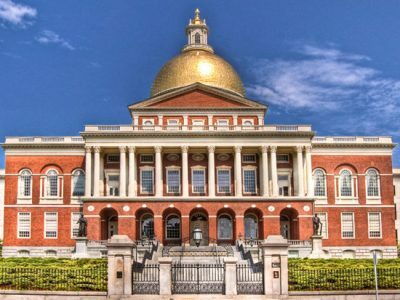 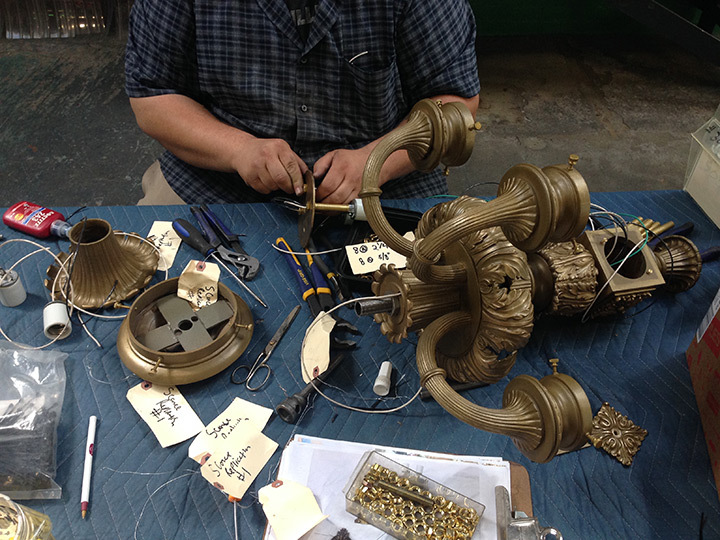 The replication included very ornate, cast bronze chandeliers, wall sconces, and desk lamps that were to be mounted on the judge’s bench. 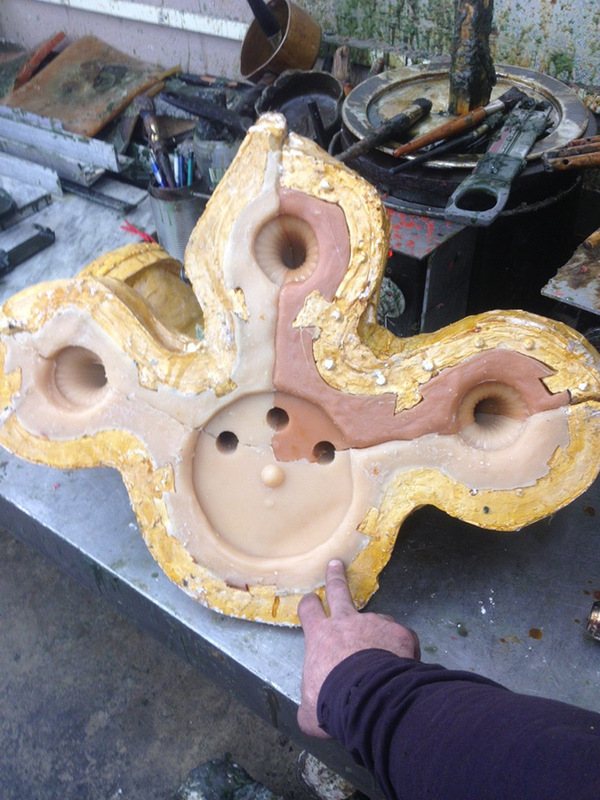 The project began with detailed drawings outlining all distinct features of these originals, which also includes a detailed mold breakout. 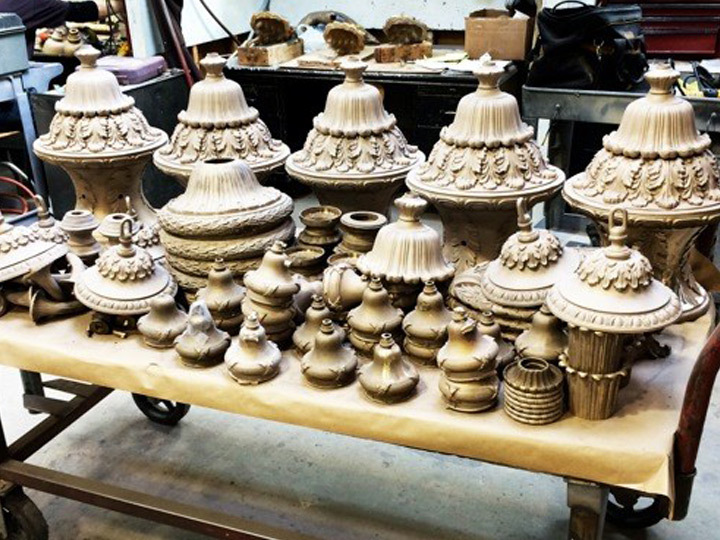 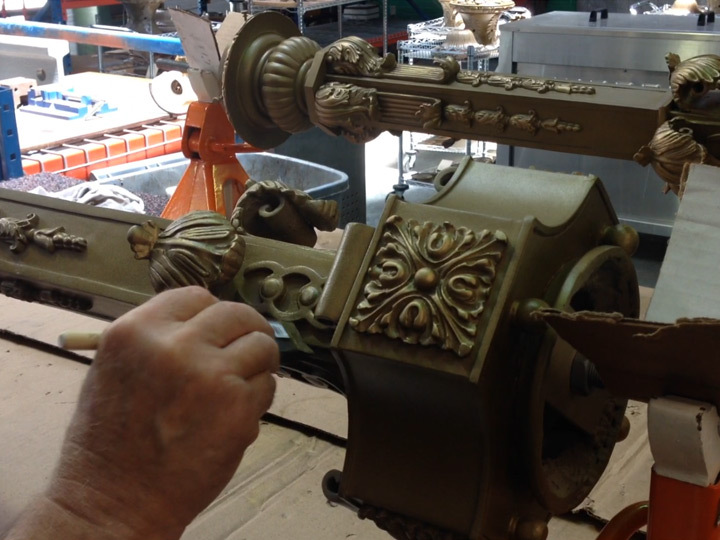 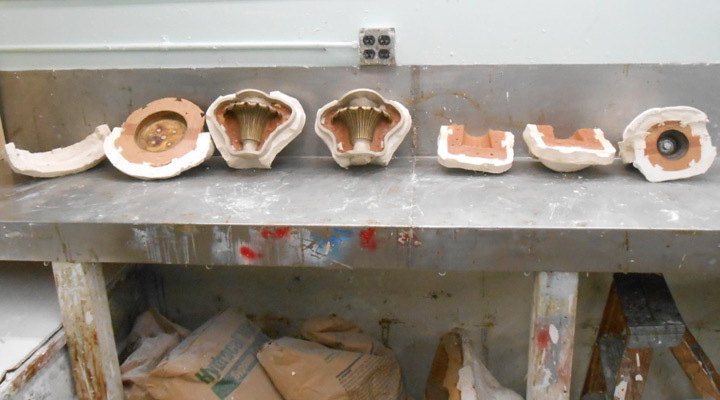 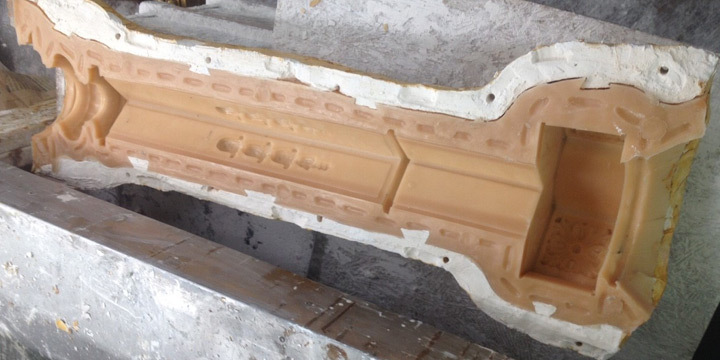 In addition to providing replicated fixtures, Grand Light was also making new molds which were going to be stored at the courthouse should they choose to have more done in the future. 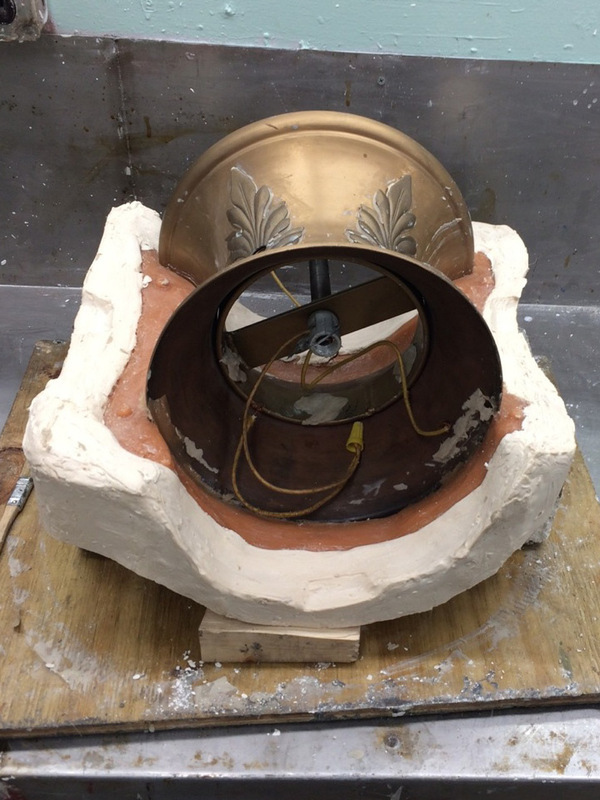 chased by using a heated metal tool to rub out the marks that show the parting line where the pieces of the mold came together. 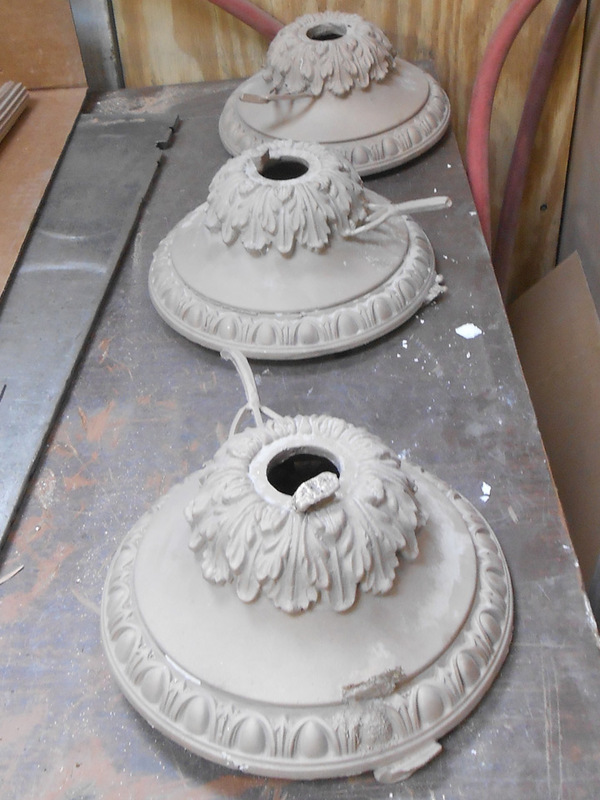 The wax is dressed to hide any imperfections in the patterns. 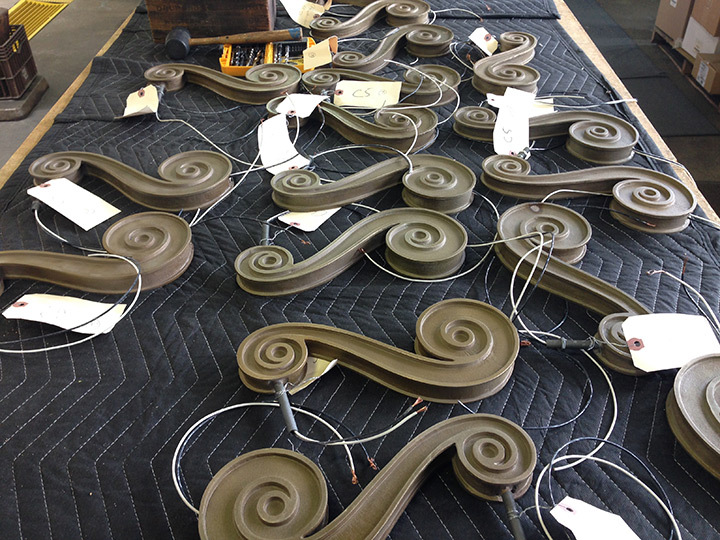 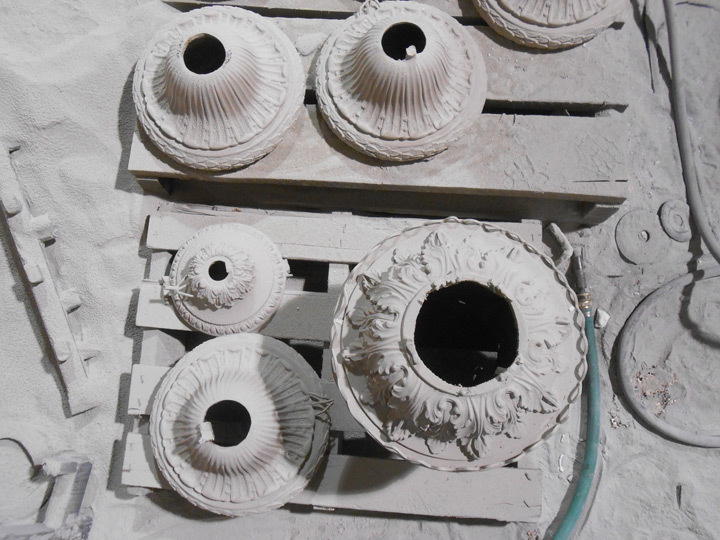 These patterns were then encompassed in a layer of wax, known as spruing, to create a ceramic shell around the mold. 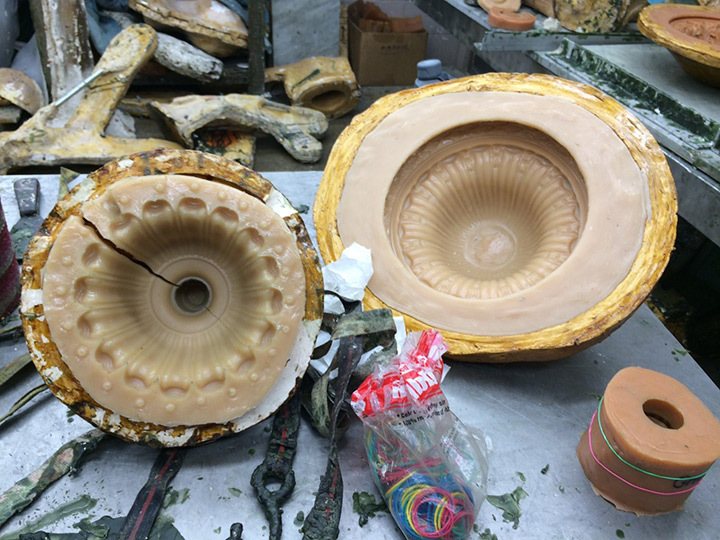 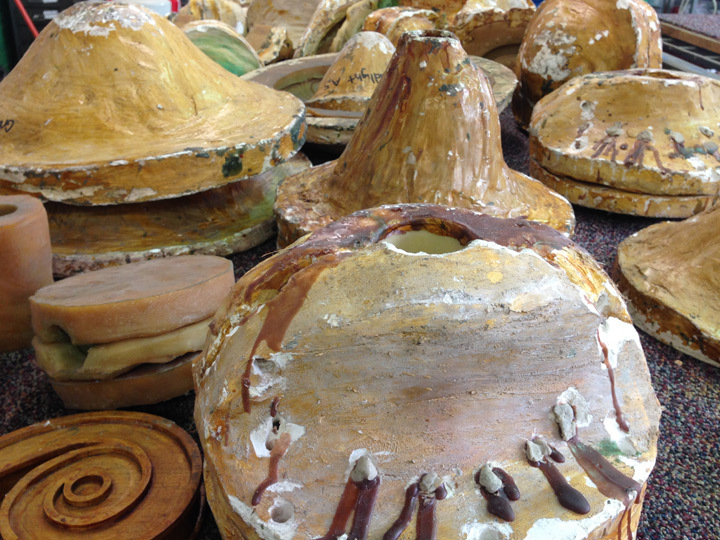 Once the ceramic shell has been allowed enough time to harden, the shell is flashed, which involves heating the wax mold until the inside melts and seeps out leaving the ceramic shell hollow. 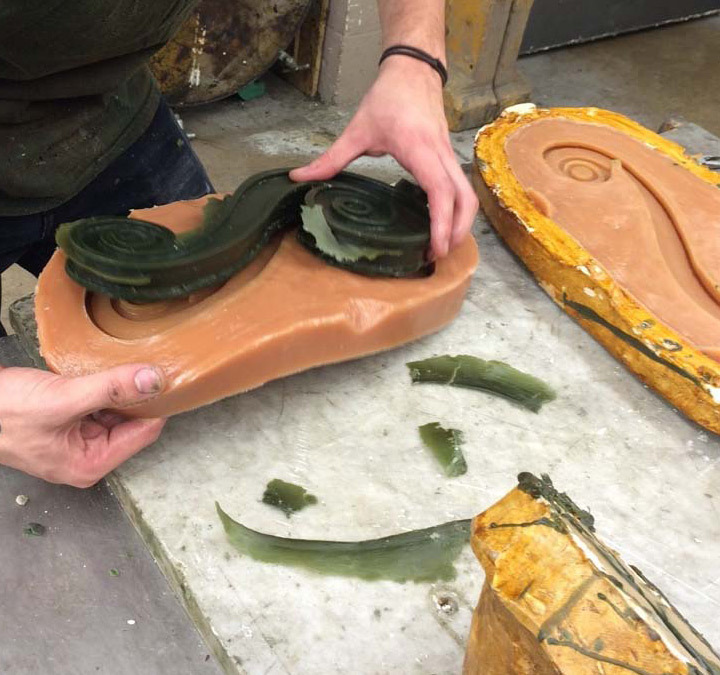 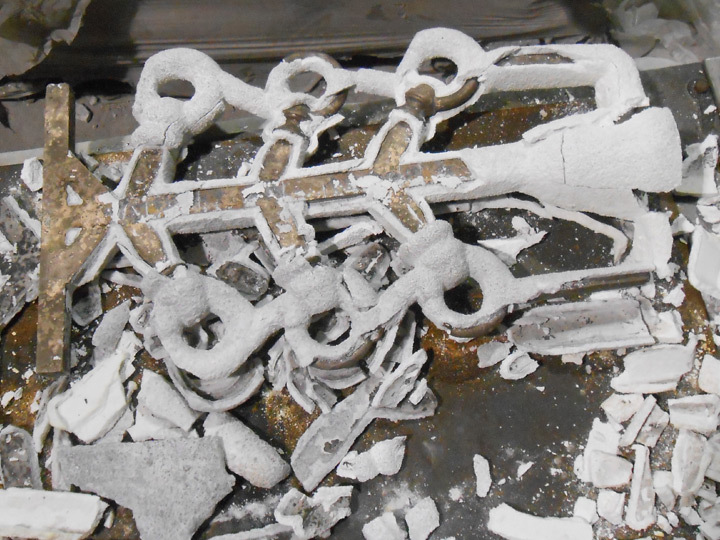 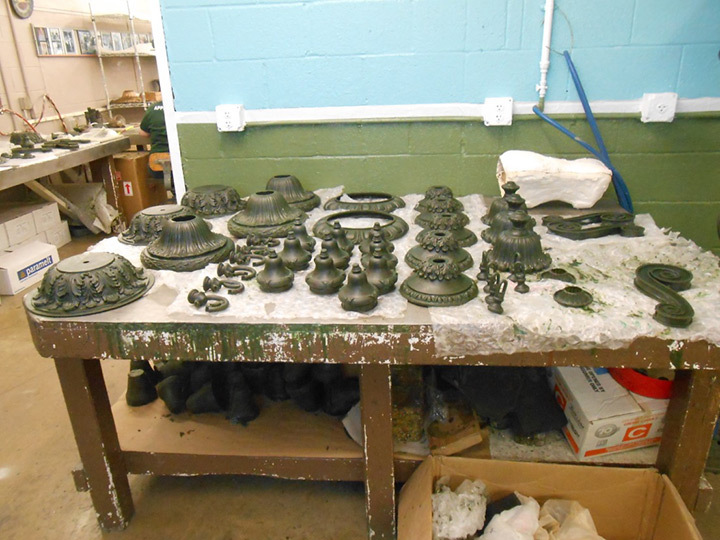 Melted bronze was then be poured into each shell to create a casting for each replicated component. 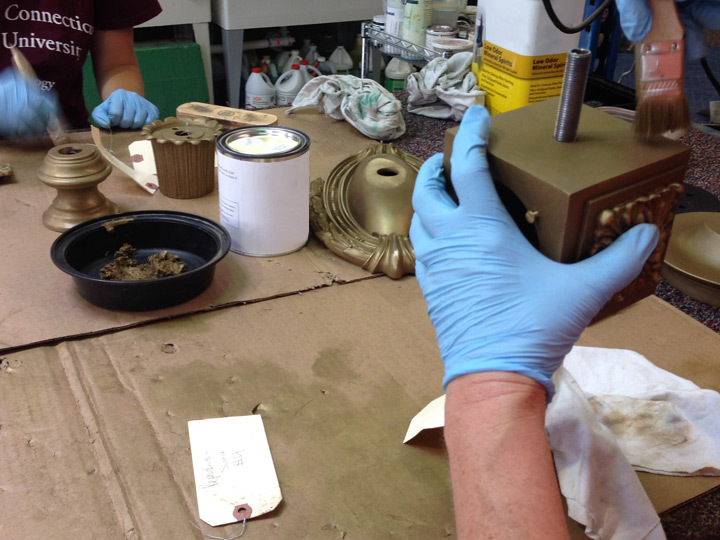 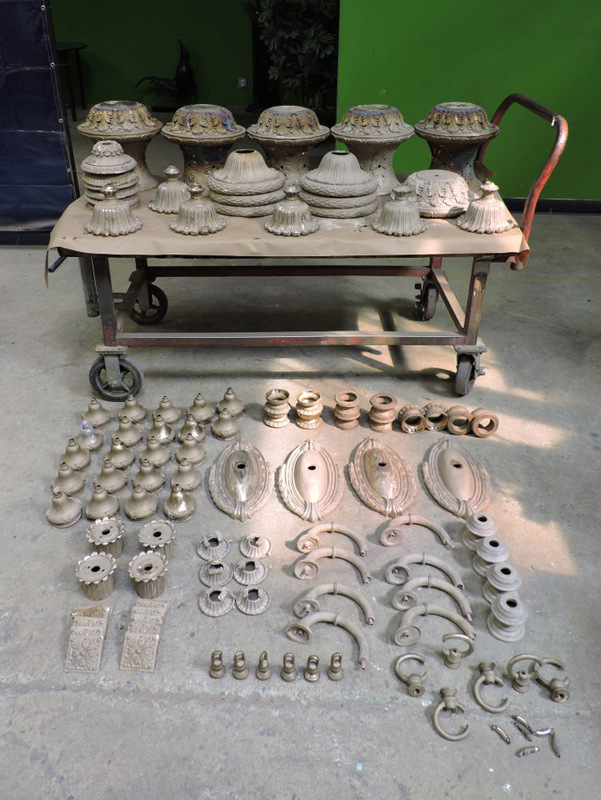 The surface of each component is cleaned and media blasted in preparation for hot patina which is formulated to match the patina of the original luminaires. 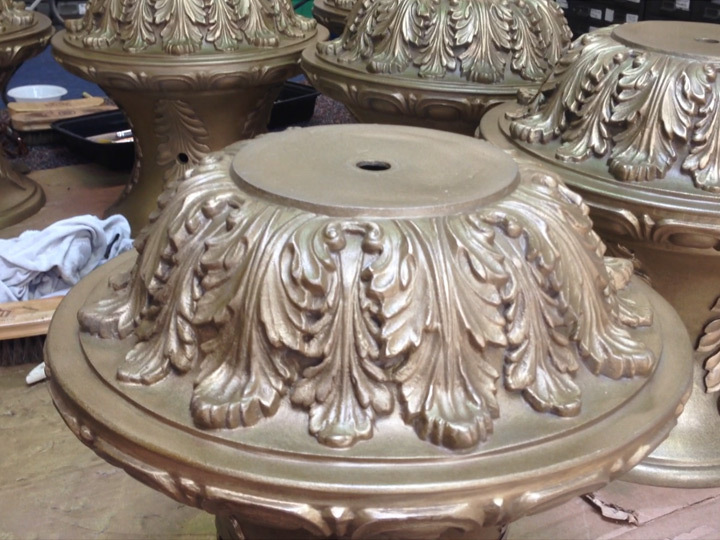 After the application of the hot patina, the surfaces of each element were hand burnished to create an iridescent, three-dimensional look. 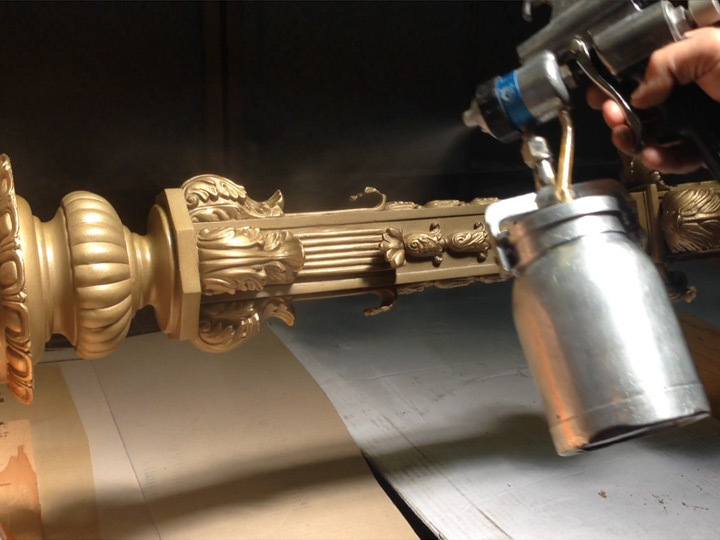 To preserve this detailing and to promote the longevity of this custom finish, a lacquer top coat was applied to all surfaces. 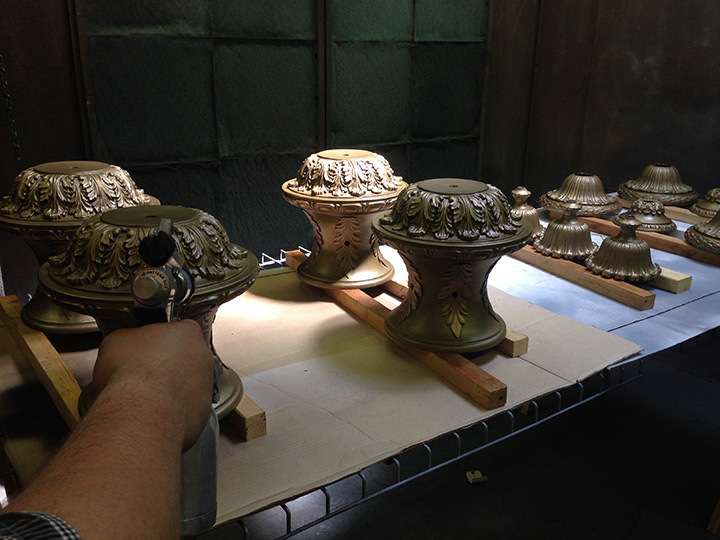 Once the components are cured, they were assembled, crated, and delivered to the courthouse by Grand Light personnel. 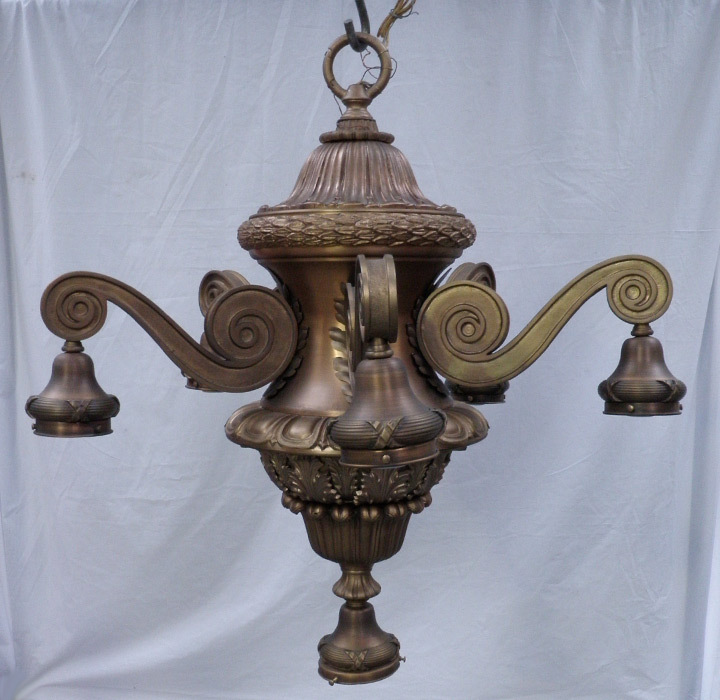 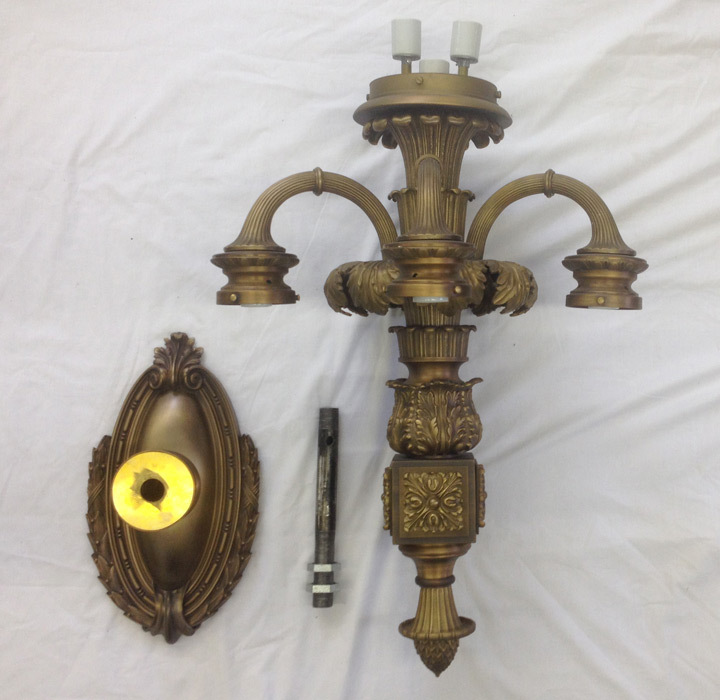 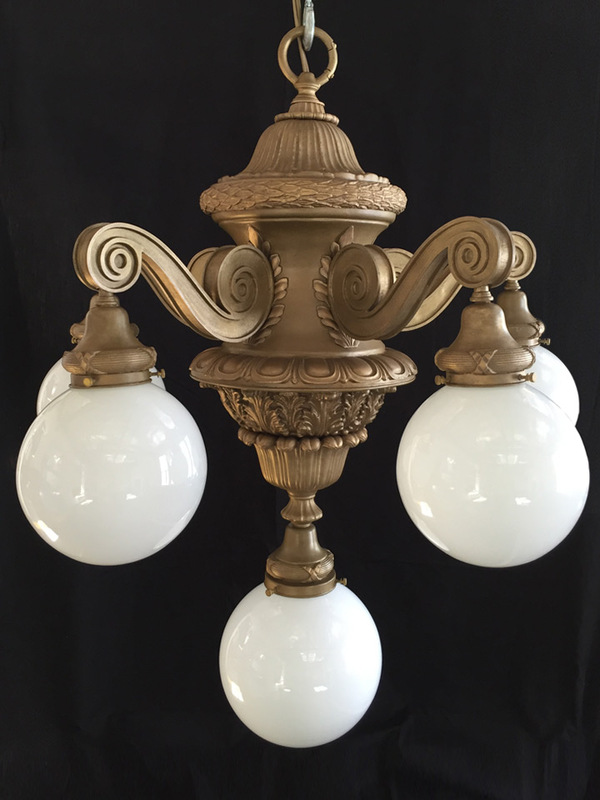 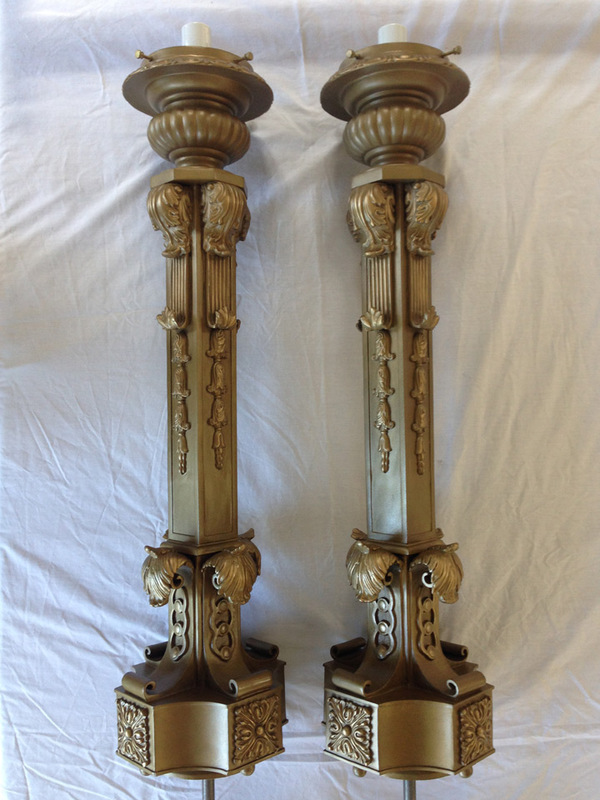 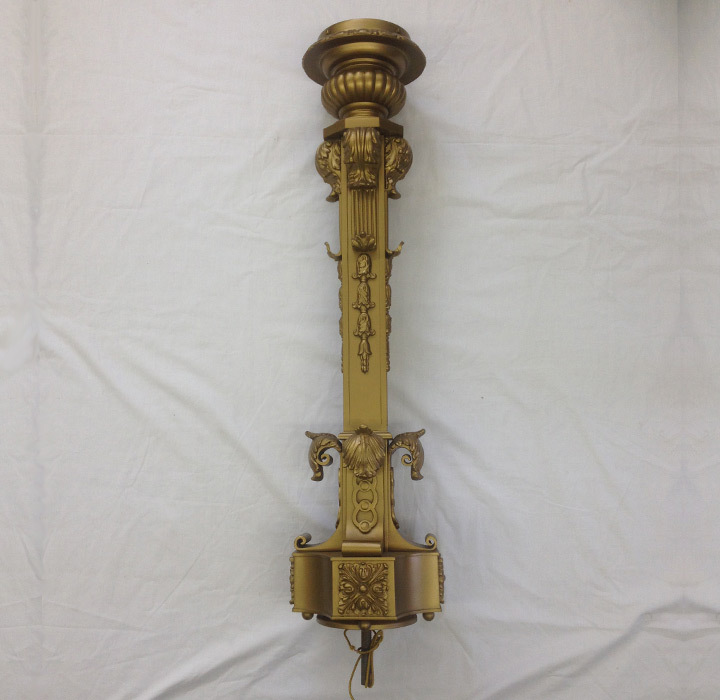 The replicated ornate, cast bronze chandeliers, wall sconces, and desk lamps.